The starting point for the now high-level negotiations was a tweet by Elon Musk in November 2018 as reported. The Tesla CEO then considered cooperation with the German manufacturer as he described Daimler’s Electric Sprinter as a “great delivery van”. 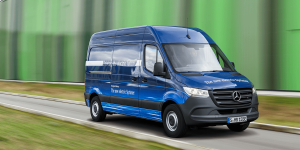 Now the conversation has taken a real professional tone, as the two companies are discussing how a partnership for the development of an electric version of the Sprinter could look. Zetsche confirmed that “these talks are happening,” but specified that the “outcome is open”. Daimler will release an electric version of the Sprinter van of their own later this year. The eSprinter will feature a load carrying capacity of 900kg, and a 150 km range. The 41 kWh version lasts for 115 km and a 1,040 kg payload instead. Moreover, Daimler has presented a fuel cell Sprinter as well, as a concept for now. For working with Tesla, it is unclear whether this could be a development partnership. Given that Daimler is about to launch the eSprinter, it is more likely, that Tesla will acquire the van. Fuel for this idea is the background of the talks that had in part been spurred by the feedback from Tesla service personnel, many of whom use the regular Sprinter in their daily operations when servicing customers. The paths of both car manufacturers have crossed several times in the past. In 2014, Daimler sold its four-percent stake in Tesla for 780 million dollars. It was said, that financial participation was no longer necessary to continue the cooperation with Tesla. From today’s point of view, this almost sounds like a prophecy.